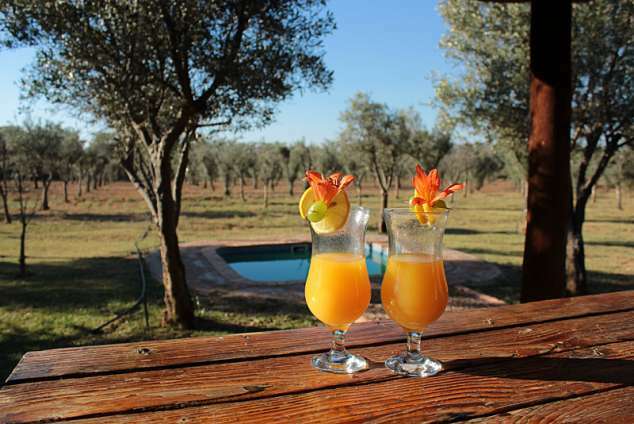 La Campagna Olive Estates - Bela-Bela Accommodation. Situated on an olive estate in Limpopo, in the heart of the Waterberg, only 15 kilometers from Bela-Bela and an hour's drive north of Pretoria. At La Campagna Olive Estate accommodation is provided in 7 well-equipped self-catering units accommodating up to 37 guests. All units feature well-eqquiped kitchens, lounge areas with DStv and private braai areas. One of the 6-sleeper and the 2-sleeper chalet also offer a private outdoor Jacuzzi. 6-sleeper in Olive grove, very private with own splash pool. All units secured with alarm systems. Additional facilities include a large, heated, salt water swimming pool, with sun loungers and a thatched sundowner area, as well as a children's play area. Renovated lapa and boma for small functions. Game drives can be arranged with neighbours nearby. - Follow R101 out of Bela-Bela, drive past Klein-Kariba, Bela-Bela lodge. - Drive PAST the gravel road that turn-off to Thaba Monate and Thaba Kwena, do not turn off there!! - La Campagna entrance on right. 57181 page views since 24 Mar, 2010. Last updated on 13 Mar, 2019.